This article was contributed by Zeeshan Khalid. Have you still any doubts about the power of email marketing? Well, let’s get straight through the facts then. “Email marketing is 40x more effective than social media marketing when it comes to gaining new customers and the number of email users worldwide is forecast to rise to 2.9 billion by 2019”. The benefits and effectiveness of email marketing is no secret. Most business owners and entrepreneurs admit to the fact that using emails as a part of sales arsenal can take revenues to a whole new level. However, in order to achieve maximum results, you need to put your efforts in the right area otherwise you may end up spending hundreds of dollars without seeing real results. Today, we are going to teach you six brilliant strategies to drive sales from email marketing. Email marketing has been around us for decades, but today it’s much different than before. Today marketers enjoy more control over the process, thanks to developers creating some awesome tools (MailChimp, Drip, AWeber etc). Capitalizing on these tools, you now have the opportunity to personalize emails by dissecting your recipients list to the finest distinctions. Segmenting by demographics. This includes age, gender, geography, persona, and education level. Segmenting by past purchases and buying cycle. Classify subscribers on a daily, weekly or monthly basis. Segment the subscribers who are loyal to your company and look forward to your emails. Newbies, who don’t know much about your brand product and services. To be honest, segmentation is a tricky process but is totally worth it and is a long-term investment. The first thing for optimal email marketing ROI is to make sure that you send relevant content to your customers. Your subscribers have trusted you and went through the hassle of providing their email and permission. So you need to respect their initiative by delivering them content they actually want. Otherwise, you may end up annoying your customers, and this can do more harm than good to your brand. A study by Lyris reveals that 39% of businesses that segmented their list experienced an increased open rate, greater customer retention, and greater customer acquisition. Your Welcome Email is the first impression on the customer and is arguably the best opportunity for building a personal relationship. Though, there is no one-size-fits-all strategy when it comes to writing a perfect welcome email as it is entirely subjective to the nature of your brand. However, marketing experts believe that this is a one-time opportunity that must be utilized to improve subscriber engagement. 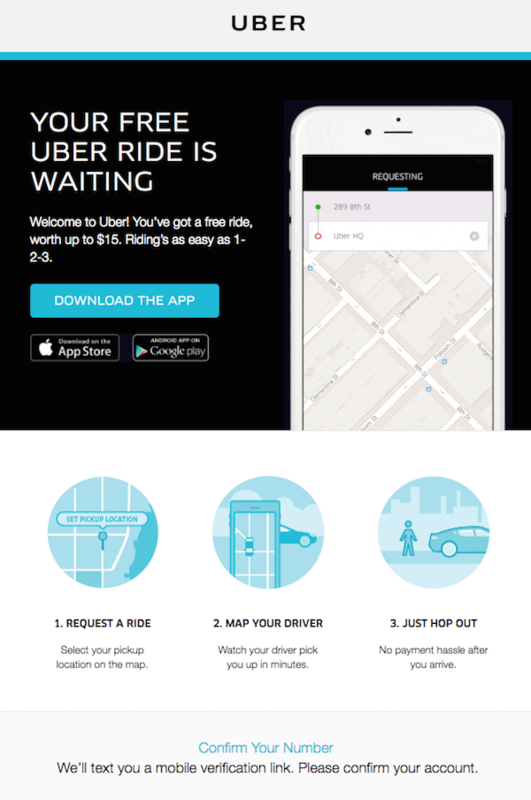 Uber’s welcome email is goal focused as it provides the customer with a little bit of everything. They educate customers on how the application works, offer a free ride, include social media buttons, powerful CTA’s and close with a reassurance. Your email must not sound like a high school essay. Get more personal and avoid the use of too many Sir and Mam’s and refrain from the fancy language. Try to create a story and avoid writing a generic email. No one likes to interact with robots. Make your customers feel that they are engaging with a human being that has something genuine to offer. Keep it short, simple. Try to cut down the text to 60% at the time you proofread. Use the word “you” for customers and “we” for the brand in the emails. Develop a natural voice. Imagine as if you are having a face to face conversation and avoid being dull and salesy. Offer prospective in the emails and something to value customers. Incorporate polls, surveys, and reviews. Customers get frustrated when they receive generic emails from companies and feel as if they are receiving dubious codes form expressionless clones. Humans are very emotional creatures and want to be treated that way. It is important for you to show your human side; nobody wants to see a display of your products 24/7. Personalization and localization when blended with emotions drive results beyond expectations. Set up automated replies and behavioral trigger emails. In order to drive maximum sales, you must come up with more innovative techniques that get your customer associate with your brand. This way, customers not only adhere to the brand but turn into brand advocates as they feel a personalized connection with you. Send greeting cards on new-year, Christmas and other special occasions. Moreover, offer personalized discounts on birthdays and anniversaries and make your customers feel special. Let’s take an example of a popular B2C brand and see if they think of it the same way. 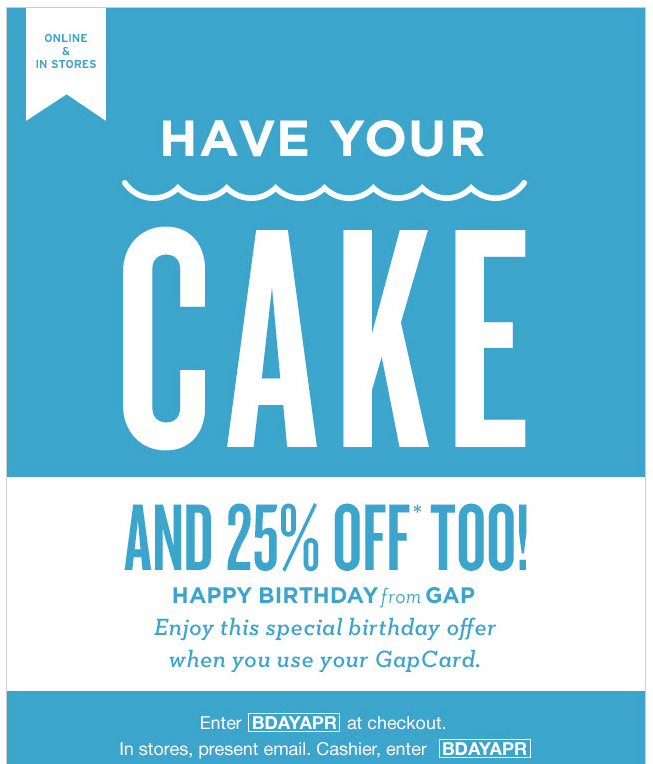 In the image below, GAP is offering a 25% off coupon to their customer on their birthday. This makes your brand relevant by taking advantage of an emotional time. This not only generates interests but also provides a significant increase in sales. People often why Gmail or Hotmail pushes their email into the recipient’s spam or promotions box. Well, it’s because when you include 10 to 12 links, the emails are considered to be dubious thus end up in the spam box. Links drive traffic and more traffic means more sales. So don’t hesitate to put 2 to 4 links to the email body. 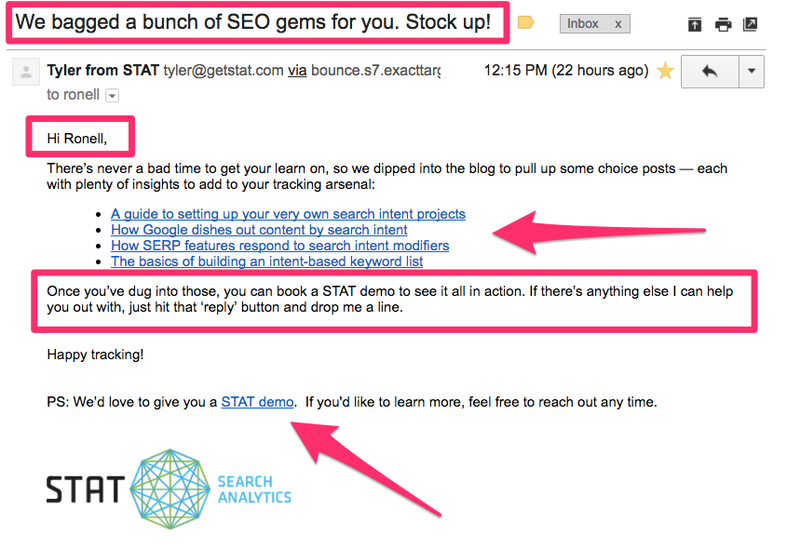 Including a PS note at the end is a great email marketing hack very few people know about. No matter how good your emails are; there are significant percentages of people who are not going to read them anyway. But still, there are a lot of other clever ways to engage them. Leave a P.S note at the end of the email or a simple question like “What do you think? Or “What is your preferred dog breed?” This easy to respond question is actually a call to action. Email marketing is a powerful tool not only for acquiring new leads but also helps in customer retention. If you start email marketing without a definite pre-defined strategy, it’s hard to capitalize on this fantastic opportunity to increase sales. Careful segmentation, personalization, engagement and clear call to actions… these are the the keys to email marketing success. These six tips will help you a draft a better plan and increase sales from email marketing. If you like this post or agree or disagree, please leave your thoughts in the comments section below. Stay tuned for next week’s article on Email Marketing Engagement. Author Bio: Zeeshan Khalid is a Web Architect, an eCommerce Specialist and an Entrepreneur. He is the CEO and founder of FME Extensions, a leading e-commerce web design and development agency. You can find him on the LinkedIn.